This list is incredible! I totally understand what you mean when you say most of the recommendations about the HP series are based off the first couple of books in the series because the later books are definitely more YA even Adult. Throne of Glass is my favourite and the detailed world draws you in just as much as the wizardry world drags us muggles in. The Raven Cycle also reminds me of HP with the similarities of the unbreakable the friendship bonds in both books. I haven’t read either of the Brandon Sanderson books but they sound right up my ally. This is a great list thanks for putting it together :)! There are also some I haven’t read yet, like Rothfuss and Lynch, so I’ll be checking those out! The Queens Thief series by Megan Whalen Turner is my number one recommendation for post-Harry Potter. Check it out! Seriously, right? It’s a real crossover, too. I’d recommend it to a MG reader, but my fifty-something brother-in-law got reinvested in reading when my sister handed him a copy of this! Also a great example of a series with many strong books, not just a great start and then a slow fizzling out. Thank you for putting together this list! I just added a handful of books to my TBR pile. It’s hard for me to find books outside of the YA world. There’s so many books I don’t know where to begin, but these sound fantastic and I can’t wait to try them out. Love so many of these book series! My favorites are Mistborn, Daughter of Smoke and Bone and The Lunar Chronicles. I hope to read the Raven Boys very soon! Great list!! I think creating a recommendation list of titles that adult readers of Harry Potter would enjoy is a brilliant idea! I really like that you included a bunch of my favorites (Throne of Glass! Cinder! Seraphina! ), and a few titles that I’d like to read too. Love your recommentations! I felt the same way about Shadow and Bone; something about the feeling of reading it reminded me of Harry Potter, which was fantastic. And the way that Marissa Meyer sprinkles clues and builds the story throughout the Lunar Chronicles reminded me of JK Rowling so much! I think that’s also why I love The Raven Boys. There is so much nuance and hidden meaning that beyond just loving the characters and the mythology and mystery, there’s something new to find every time you read. It’s the only series I’ve read more than once besides Harry Potter! I need to give Locke Lamora another try, it was a little overwhelming the first time around. And I’ve heard great things about Name of the Wind and Daughter of Smoke and Bone. I’ve personally only read one or two of these books but the majority of them are on my TBR list. 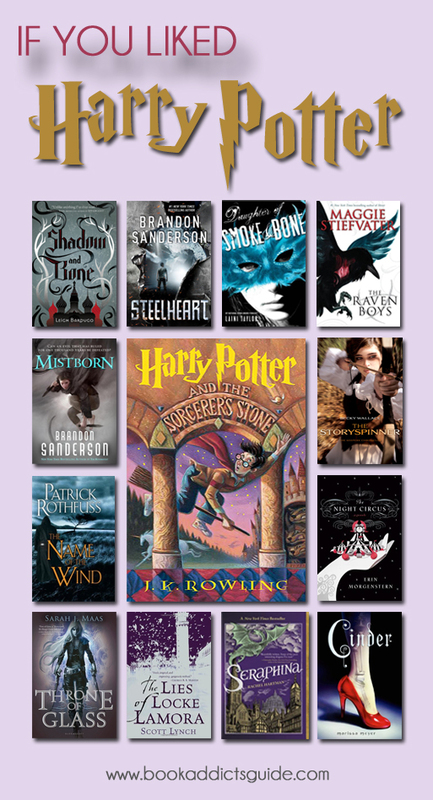 These are really good choices to compare to those who liked Harry Potter because they all share a grand mystical theme, which personally I love in books! You have some great books on this list! I’m always torn on what to recommend to people who like Harry Potter because it’s hard to think of a book that has the same “feel” as the Harry Potter series. Interestingly, I don’t even think there were really a lot of wizard boarding school knock-offs after Harry came out. It was a trend, but definitely different from what happened with Twilight, The Hunger Games. etc. I think people just generally started writing more fantasy, of various kinds. I recommend The Hollows series by Kim Harrison. I can’t say it’s better than Harry Potter but it’s 100% equal for me. I’m on the 2nd last book in the series and am just as obsessed. I have no idea how to grade the *-ology of Nicholas Flamel but I liked them very much.